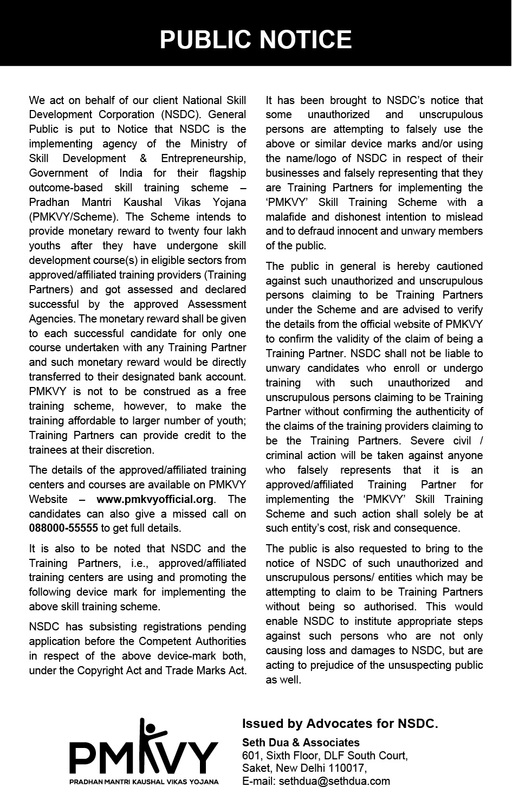 The National Skill Development Corporation has notified “Pradhan Mantri Kaushal Vikas Yojna (PMKVY)” (a Phase II of the STAR Scheme) which aims to skill unemployed youth is the flagship outcome based skill training Scheme of the new Ministry of Skill Development & Entrepreneurship (MSDE). The Objective of the skill certification and reward scheme is to enable and mobilize a large number of Indian youth to take up outcome based skill training and become employable and earn their livelihood. This Institute is affiliated with Leather Sector Skill Council to conduct a “Placement linked skill training program for unemployed Youth” funded by Tamil Nadu Skill development corporation (TNSDC), Govt of Tamil Nadu to facilitate the unemployed segment to develop the skill solutions with hands on training by Central footwear Training Institute (CFTI, Chennai) and place them at appropriate demand in the industry as per the requisite skilled manpower needed to sustain the envisioned growth of the leather/ Footwear, leather goods and Leather Garments industry and setting a foundation for the country to emerge as a global leader. A scheme called “ National Skill Certification and Monetary Reward Scheme ” has been recently launched on 16th August’2013 by the Hon’ble Finance Minister. The Scheme was implemented by NSDC (National Skill Development corporation), Ministry of Finance, Govt. of India. The core objective of this programme is to encourage skill development for youth by providing monetary awards for successful completion of approved training programmes. Nine sectors have been identified for implementation at first instance and Leather sector is one of them. The National Occupation Standards (NOS) have been developed by the NSDC for different training programmes which has to be followed. It is aimed to train 10 Lakh people within a year’s time in total and 50,000 for Leather sector. Status of Training Programme : CFTI, Chennai successfully completed training for 1995 candidates with pass percentage of 94% (2nd place in the Leather Sector Skill Council) till 31st July 2015.